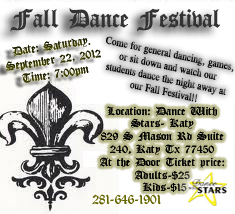 DWS Academy would like to announce that the Fall Dance Festival 2012 has been postponed till October 19th 2012 at 7.30pm. Tickets are on sale now, feel free to contact us at any time to reserve your VIP seats. Next PostNext Holly Jolly Holiday Showcase and Party!